The new Lamborghini Aventador S is characterized by new aerodynamic design, redeveloped suspension, increased power and new driving dynamics. The ‘S’ is the suffix of previous enhanced Lamborghini models and defines a new benchmark for the V12 Lamborghini. The Aventador S is visionary design, cutting-edge technology and driving dynamics in pure harmony, and elevates the concept of super sports cars to a new level. A more aggressive nose and longer front splitter redirect airflow for better aerodynamic efficiency, improved engine cooling and increased cooling to the radiators. Two air ducts in the side of the front bumper reduce aerodynamic interference from the front tires and optimize wake flow to the rear radiator. The rear of the Aventador S is dominated by a black diffuser, available on request in carbon fiber, characterized by a number of vertical fins that amplify the airflow effects, reduce drag through pressure recovery and generate downforce. Three single exhaust outlets exit through the rear bumper. The active rear wing is movable in three positions depending on speed and drive select mode, and optimizes the car’s improved overall balance, working with vortex generators created in the front and rear of the chassis’ underside that maximize air flow as well as assist in brake cooling. 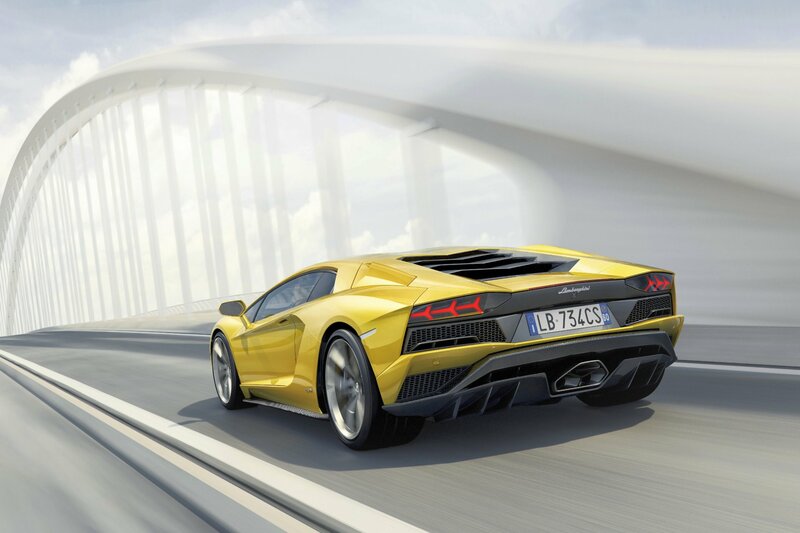 The Aventador S design results in significantly enhanced aerodynamic performance. 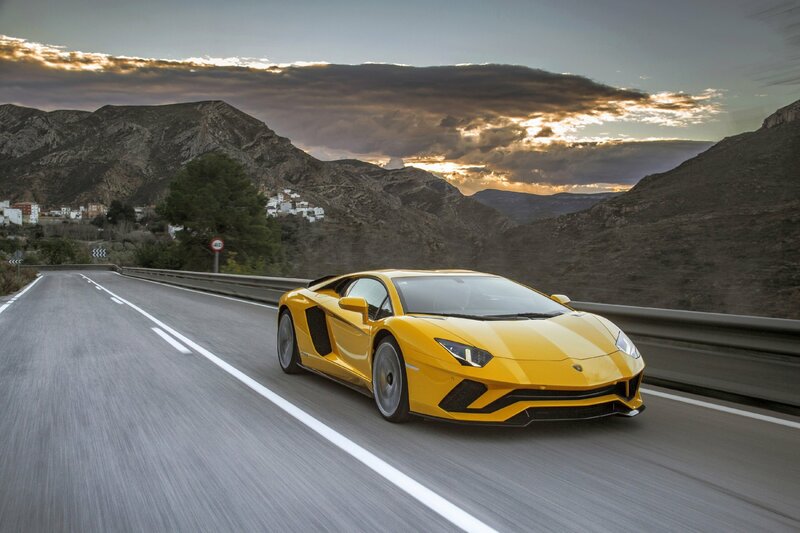 Front downforce has been improved by more than 130% over the previous Aventador coupé. When the wing is in its optimum position the overall efficiency at high downforce is improved by over 50%, and in low drag by more than 400% compared to the previous model. 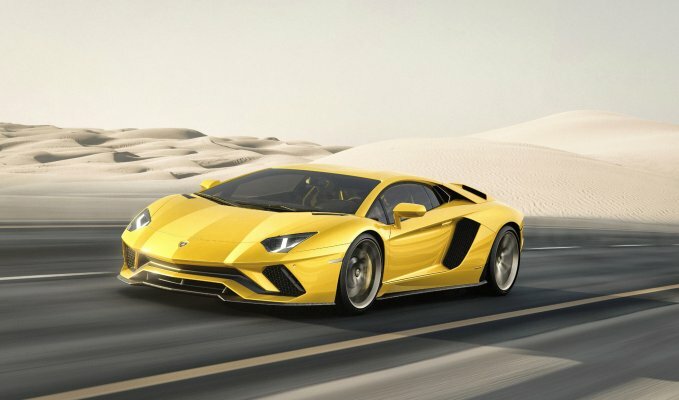 Four-wheel drive, new active suspension, new four-wheel steering system and the new EGO driving mode The Aventador S chassis retains the Aventador’s unique and extremely rigid lightweight carbon fiber monocoque with attached aluminum frames resulting in a dry weight of just 1,575 kg. Enhanced lateral control comes from new four-wheel steering, adopted for the first time on a series production Lamborghini. The system provides improved agility at low and medium speeds and more stability at high speed. On the front axle it is combined with Lamborghini Dynamic Steering (LDS), tuned for a more natural and responsive feel with a sharper turn-in. It is specially adapted to integrate with the active Lamborghini Rear-wheel Steering (LRS) on the rear axle: two separate actuators react in five milliseconds to driver’s steering movements, allowing a real-time angle and cornering stiffness adjustment. At low speeds, rear wheels wheels face in opposite direction to the steering angle, thereby virtually reducing the wheelbase. With less steering wheel angle required, the Aventador S is more agile with a reduced turning radius, ensuring higher performance in curves and making it easy to maneuver in town and at low speeds. Conversely at higher speeds both front and rear whe els share the same steering angle, thus virtually extending the wheelbase, providing increased stability and optimizing the responsiveness of the car. Vertical control comes from Lamborghini’s updated pushrod and Lamborghini Magneto-rheological Suspension (LMS), with revised kinematics adapted to the new four-wheel steering. New suspension geometry, optimized for Lamborghini Rear-wheel Steering, includes upper and lower arm and wheel carrier to reduce caster and load on the system. A new real-time variable damping system optimizes wheel and body control, and balance and ground stiffness is maximized. New rear springs also enhance the car’s balance. Longitudinal control is achieved via an improved ESC strategy with faster and more precise control of traction control and vehicle dynamics, depending on the driving mode selected. Extensively tested on surfaces such as snow and ice, the Aventador S has improved adhesion detection to maximize grip in all conditions and enhance its handling capabilities. 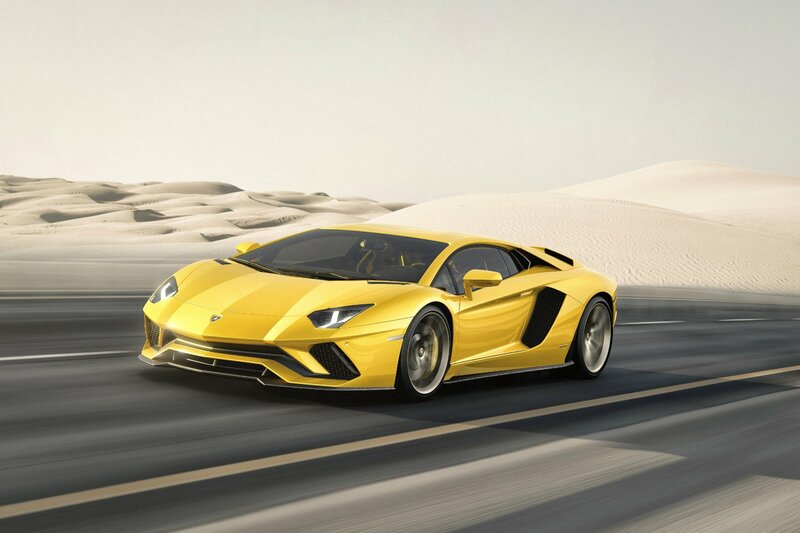 The Aventador S permanent four-wheel drive has been calibrated for the stabilizing effect of the new Lamborghini Rear-wheel Steering, allowing more torque to the rear axle: when powering off the throttle, less torque is shifted to the front axle to allow over-steer behavior and a sporty, but safe drive. 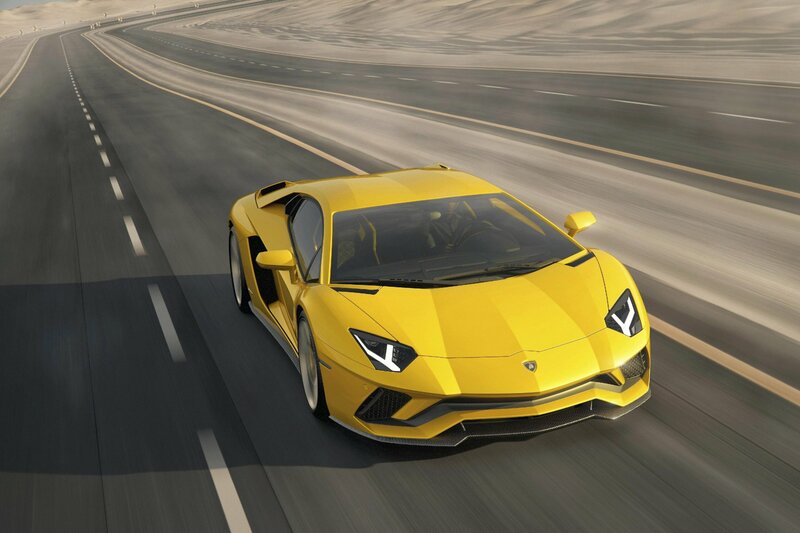 The Aventador S allows the driver to select between four different driving modes: STRADA, SPORT, CORSA and the new EGO mode, which influence the behavior of traction (engine, gearbox, 4WD), steering (LRS, LDS, Servotronic) and suspension (LMS). STRADA stands for maximum comfort and daily use. SPORT provides a sporty, rear-wheel drive feel and CORSA is suitable for maximum track performance. EGO is the new driving mode option. This provides several additional and individual set-up profiles, customizable by the driver, selecting his preferred criteria for traction, steering and suspension within the STRADA, SPORT and CORSA settings. 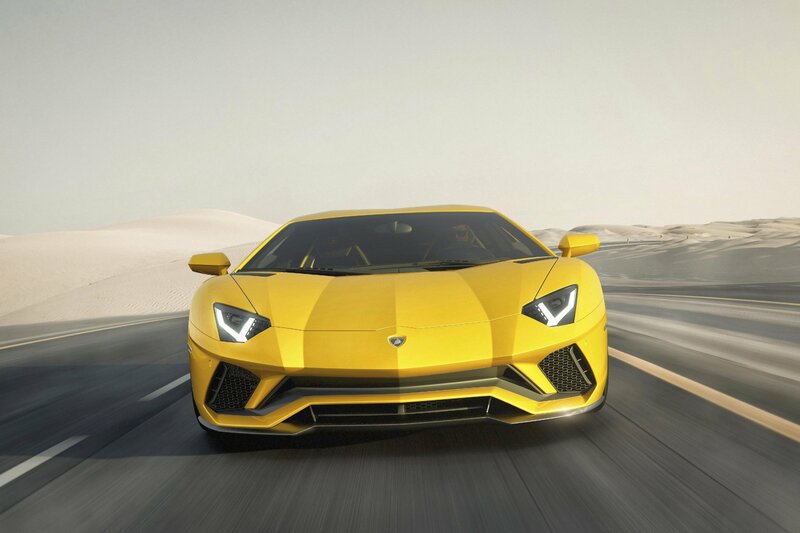 All driving modes have been recalibrated in the Aventador S, improving ESC integration with all-wheel drive and the interface between engine torque management system and traction control reaction. 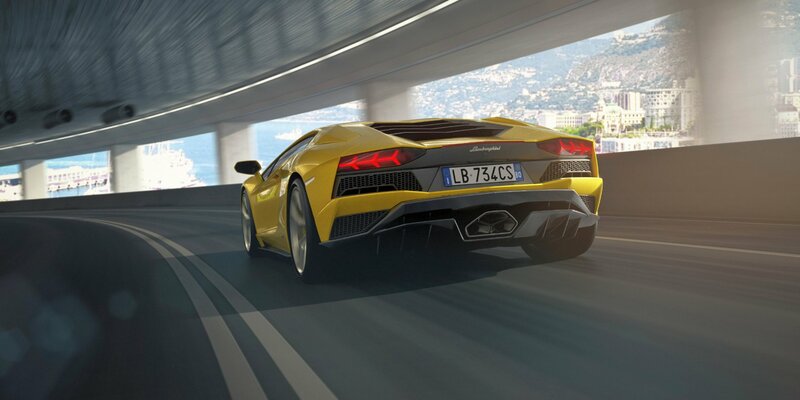 The continuous torque split to front and rear axles in each driving mode is recalibrated for the Lamborghini Rear-wheel Steering and the differentiation between the driving modes is enhanced. In STRADA, the progressive damping is smoothed for better comfort and stability on rough roads. Torque is split 40/60 to the front and rear as standard: safe and stable with maximum adhesion, the car is easily driven and controlled. 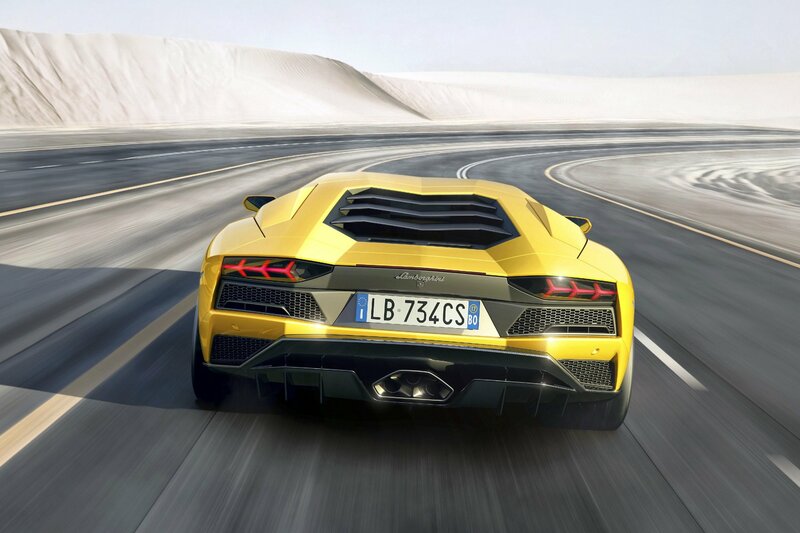 In SPORT mode, the stabilizing effect of the Lamborghini Rear-wheel Steering allows up to 90% torque to the rear wheels for maximum sportiness and driving fun on curving roads. Driving precision and driver feedback is improved, while maintaining safety and without compromising on comfort. When powering off the accelerator, less torque is shifted to the front axle to enhance the car’s agility, with oversteer and drifting easy using light throttle and steering wheel control. In CORSA, drivers experience less intrusive dynamic and traction control intervention while maintaining driving precision and traction. High levels of damping force maximize driver feeling and feedback from driver inputs including steering, braking and throttle. Counter-phase steering is enhanced in high-performance situations and torque is balanced to both axles, with a maximum 20/80 split to front and rear for more neutral behavior and to maximize track-oriented performance. The Lamborghini Aventador’s naturally aspirated twelve cylinder, 6.5 liter engine outputs an additional 40 hp over its predecessor, to a maximum 740 hp, with a 690 Nm of torque at 5,500 rpm. To achieve the power increase, both VVT (Variable Valve Timing) and VIS (Variable Intake System) have been optimized in order to obtain an enriched torque curve. Additionally, the maximum engine revs have been increased from 8,350 to 8,500 rpm. A dry weight of just 1,575 kg provides a weight-to-power ratio of just 2.13 kg/hp. Acceleration from 0-100 km/h is reached in 2.9 seconds, with a top speed of 350 km/h. 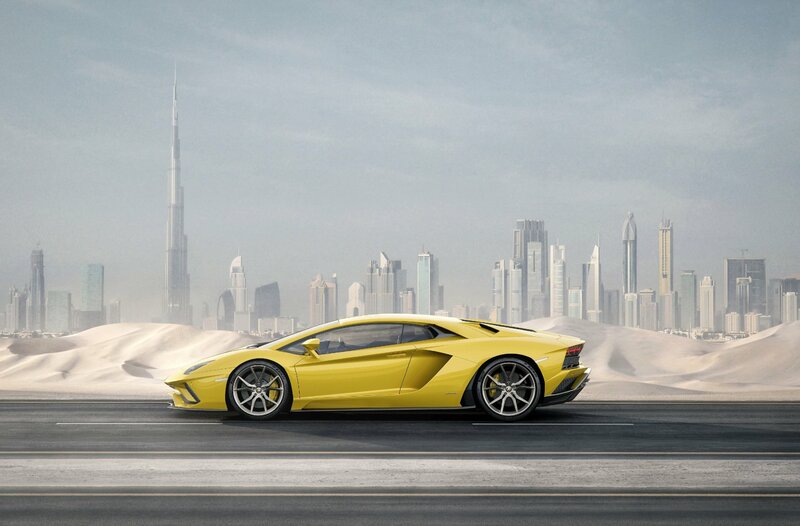 Transmission is provided by Lamborghini’s lightweight Independent Shifting Rod (ISR) 7-speed shifting system, providing robotized gear shifts in up to 50 milliseconds. As in its predecessor, the Aventador S is equipped with a stop-and-start system and cylinder deactivation for optimized engine efficiency. When full engine capacity is not required, six of the twelve cylinders are temporarily deactivated by switching off one cylinder bank. When the driver accelerates, the system switches back instantaneously to twelve-cylinder mode, with the changeover virtually impossible to detect by the driver. The Aventador S sits on a new, specially developed set of Pirelli P Zero tires. Designed to optimize steering, traction, lane changes and braking efficiency, the tires are specifically designed to respond to the dynamic behavior induced by the Lamborghini Rear-wheel Steering, ensuring handling consistency and driver feedback. With improved force generation from both front and rear tires, the Pirelli P Zero tires provide a higher la teral acceleration and reduce understeer characteristics. Carbon ceramic brakes are standard equipment for the Aventador S. The ventilated and perforated carbon ceramic discs (Ø 400 x 38 mm – Ø 380 x 38 mm) enhance braking performance from 100 km/h to st andstill in 31 m.